This blog was initially posted by Sean Whitaker in 2014 but we felt that it was worth of a second life. It covers content from his book The Professional Project Manager all page references are for that book. 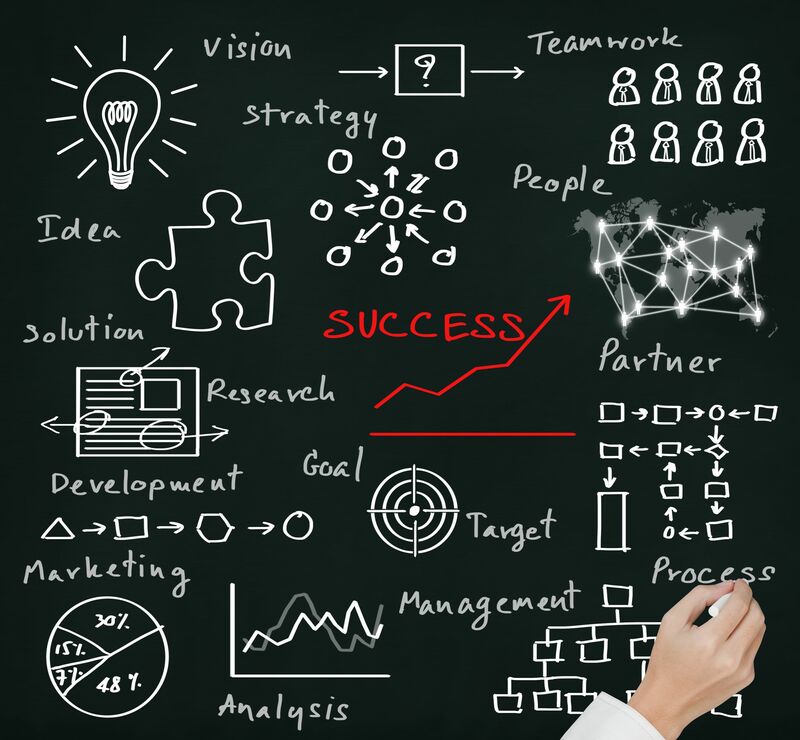 As a project management consultant I have often been asked to provide clients with an off-the-shelf, or ready made, project management methodology. In one sense this is good thing as it shows a commitment to increasing project management maturity within an organization. However, I have come to see it as a liability and in fact counter productive and very rarely contributing to an increase in organisational project management maturity. Too many organisations view an off-the-shelf, or ready made, project management methodology as the easy answer to all their project management problems. They assume that if the pay the licensing fee, send people to get accredited and put up colorful posters around the workplace that people will actually use the methodology, that the methodology is right for them and that as a result they will have a huge increase in successful delivery of projects. They seem genuinely surprised when no one uses the project management methodology and there is still a lack of consistency and maturity. This also does a huge disservice to many fine off-the-shelf, or ready made, methodologies that are available. They are really quite good but they aren’t as good as your own tailored methodology and the process of developing it yourself. The alternative to an off-the-shelf, or ready made, methodology is to instead spend the time and money set aside for licensing and accreditation fees to develop your own tailored project management methodology. The results will be better suited to your organisation and longer lasting because you developed it yourself, using your own language and created your own champions. 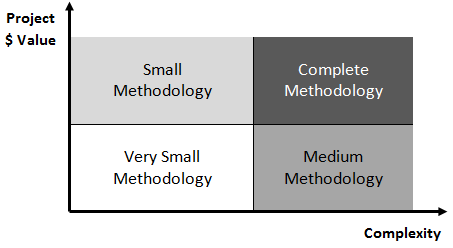 A methodology is your organisations’ particular collection of processes, tools and techniques and templates that you choose to use. Tailoring is the processes of choosing which of these are appropriate to use on any given project. One size doesn’t fit all. Your methodology doesn’t suit my projects, additionally your methodology also doesn’t suit all your projects. Therefore, it should also be flexible and scalable enough to be able to be used on all your projects. Within your organisation it is the project management office (PMO) that is responsible for developing, monitoring and improving your project management methodology. However, it is the individual users of the methodology that must agree to adopt, use and improve it so having them onside and involved during the creation of your methodology will improve it. The main difference between the two ends of the spectrum, and all points in between, is the speed of iterations and the amount of certainty in the project. Traditional methodologies move through their iterations slowly and usually have very well defined project. Agile methodologies move through their iterations extremely rapidly in comparison and deal with much less certainty. Apart from that the methodologies actually have a lot in common. Have a look again at the diagram on page 49 of this book. It outlines a broad framework for the project life cycle and also for a methodology regardless of whether it is traditional or an Agile one. So, don’t get too caught up in labelling your methodology as one or the other. Simply be inspired by the right style of methodology for your projects. The benefits of developing your own methodology is that you can leverage off existing intellectual property, accommodate the organisational culture and get by in from the project management team by seeking their input on what constitutes an appropriately tailored methodology. A disadvantage to making your own methodology is the time and effort it takes to get it from initiation to working methodology with processes, tools and templates. However, most people don’t see this and assume that simply by taking an off-the-shelf, or ready made, solution that it will solve all their problems. The benefit of getting an off-the-shelf solution is that it is available right away and it is a known methodology. The drawbacks are that people assume that because it works for someone else that it will work for them when this is not always the case. The instant methodology does not reflect the organisational culture or industry. Also, there is no control over intellectual property and there can be a lack of buy in and support from project team members. The first is the initial tailoring you do to select those elements that will form your project management methodology. Here, you select from a body of knowledge such as the PMBOK® Guide, all those processes, tool and techniques that are appropriate to the styles of projects you are doing based on their complexity and size. I believe that the factors which influence the choices you make in developing a project management methodology are project size, complexity, organisation and team culture, and internal and external constraints. Once this initial process is complete you will have a methodology that is able to be used for your projects. If your projects are all largely similar then the methodology will be a fairly standardised one used without much change between projects. If however, the size and complexity of your projects varies considerably, then this first stage in tailoring your methodology will result in a scalable and flexible methodology that can be adapted to be used on all your projects. Some specific examples of scalability and flexibility include the type and size of any project charter, the range of scope definition and extent of planning completed and, the effort put into risk management and communications management. The third stage of tailoring is completed during the execution of the project where you are checking that the particular combination of elements you have selected is still appropriate and you are not over cooking or under cooking a project. Tailoring is an iterative process done throughout the entire project life cycle. The PMO should have an input into this review process, and oversee and approve any changes. Adding your lessons learned about the application of your selected methodology to your lesson learned process helps other project managers in the future. 1. Assess current and optimal level of project management maturity (see the exercise on page 25 of The Professional Project Manager or use another commercially available model), the purpose of this exercise is twofold. First to get a picture of where you are now and where you should be in relation to project management maturity and capability. The second reason is to provide benchmark against which we can measure future change (hopefully improvements) in the level of project management maturity bought about by the newly introduced project management methodology. 2. Gather and document all of your existing templates, software, processes, user manuals and other supporting material. Complete an inventory of what you already have so you don’t reinvent the wheel. Note any duplicate templates, processes or other elements. As part of developing your own methodology you are going to have to choose which one best suits your purposes. This may mean building a new one with the best bits of each. 3. Get your project team members together and spend some time mapping out the process for how projects should work. Make note of the milestones, documents, processes and other elements that occur at different stages. 4. Now, fill in the blanks of what is missing. Visit websites and download lots of free templates, processes, user manuals and guides – see pages 54 -55 of The Professional Project Manager for handy hints of websites giving away free, or nearly free, document, user guides, process description and templates. 5. Build your methodology iteratively by using your team to document a process flow chart, user guides, standardize templates and other aspects of your methodology. Don’t worry about building everything straight away; focus on the most important aspects first. Then take into account the size of your organisation and projects, your organizational and project team culture, the complexity or your projects, the duration of the project and the level of organisational project management maturity. Make sure that everyone knows where to find the elements of the new methodology. I am seen instances of organisations with methodologies stored away that nobody knew existed. 6. Go ahead and use your methodology as planned. Note whether it is working as expected and be prepared to make changes to it to improve its suitability. 7. Conduct audits to see if the methodology is being used as expected. The audits will reveal opportunities for continuous improvement as well. Update your methodology as required. Here’s one I prepared earlier . . . The diagram on the next page shows a typical process flow chart for a fairly generic project management methodology. I am offering it to you as a starting point only to get you on the way to developing your own project management methodology. Please take from it those parts that are useful and customize it to suit your organisation and your projects. You will see that I have clearly labelled each part of the processes in the methodology. This allows me to quickly see where any of the projects in my portfolio are at. Here is a brief description about each part of the project management methodology. P1 Initiate the Project – this is the part of the methodology where projects are initiated. This process starts with a professional project selection process. It may feature a business case, a contract that has been signed or a work order. It ends with a milestone of formal project approval, usually with a signed project charter. The types of documents and templates you would have here include business cases, project selection process description and project charter templates. P2 Plan the Project – This is the part of the methodology where all appropriate planning actives are carried out. This is a highly iterative process and will be continued throughout eh project. In this process you need to define the expected level of planning that should be done before executing any planned work. You also need to define the type and content of planning documents. Between the planning process and the executing process you should have a kick off meeting as a milestone. The kickoff meeting is held with stakeholders once enough planning has been done to start project execution. The types of documents and templates you would have here include all the various plans and baselines. P3 Execute the Plan – this part of the methodology sets out how you will carry out all the planned project work. This is the doing part of the project. Make sure that whatever you are doing is guided by an appropriate planning document. Executing activities also include checking that what you are doing matches what was planned. P4 Control Changes – This part of your methodology is very important as it is your approved change control process. This is where you assess the impact of any changes and assess them via your approved change control process. Any changes will probably require a change to the planning documents and that it why there is a feedback loop back to planning here. The types of documents you will require here include a change control process, change request templates and a change request register. P5 Report Progress – this part of the methodology is where progress is reported. It is included as a separate part of the methodology just to emphasize its importance. You may choose to have it as part of either your executing or change control parts of your methodology. The documents and templates include project reports, media releases and status update templates. P6 Close the Project – this part of the project is where project closure activities take place. It is represented in the process flow chart as being at the end of a sequence but in reality you may start project closure actives while still executing and controlling change. The types of activities you would perform here would be captured in your project closure checklist that you developed as part of your project planning work. P7 Post Implementation Review – this part of the project methodology is where you revisit the original outcomes and benefits the project was intended to deliver to see if they were achieved. Whether they were or not, documenting what actually occurred will contribute to future project success via lessons learned. You will need to define an appropriate timeframe to perform the post implementation review and the types of documents and templates that would be useful to you include the PIR template, benefits realization guidelines, and lessons learned templates. Please remember that this diagram is offered as a guide only. 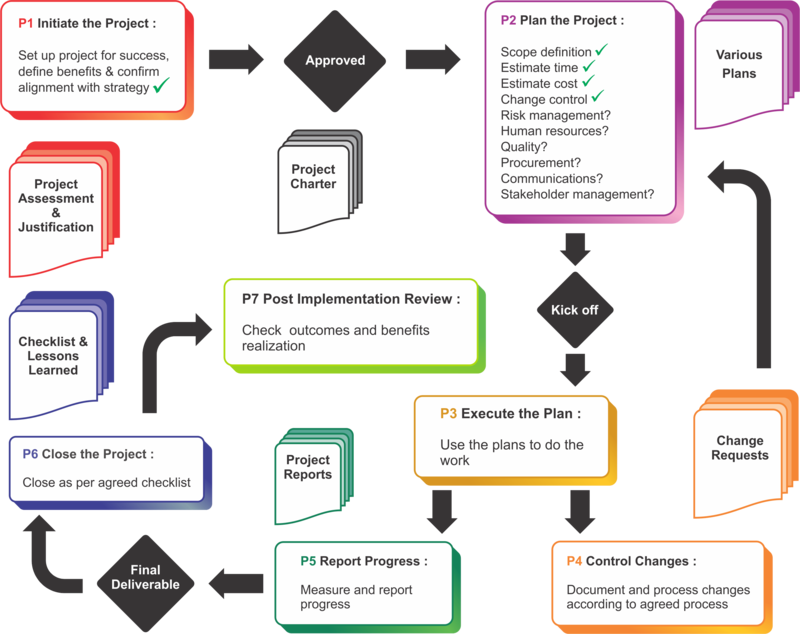 It should serve as a starting point for your own process flow chart, documents, templates and user guides that you need as part of your own tailored project management methodology. Once you have put together your own methodology it is a really good idea to represent it graphically and put it in places where everyone can see it. This assists with getting people to use the methodology. The key role that a consultant can play during the process of developing your own tailored project management methodology is one of empowering employees to develop their own appropriate methodology. In this role the consultant acts as supporter, subject matter guide, and mentor and change agent. At the end of the day it is the role of the consultant to put themselves out of a job as fast as possible because in doing so you have ensured that there is increased professional capability within the organisation which is much longer lasting than a typical transaction with a consultant. If you do wish to have a chat about your plans to develop an new or refine an existing PM Methodology do drop me an email at SeanW@falconppm.com and I will be delighted to respond. Remember we have PMP® Exam Prep courses booked throughout the year.